Mount Vernon Square, with Mount Vernon Place United Methodist Church, Washington Convention Center, Historical Society of Washington DC, and former NPR Headquarters visible. Mount Vernon Square is a city square and neighborhood in the Northwest quadrant of Washington, D.C. 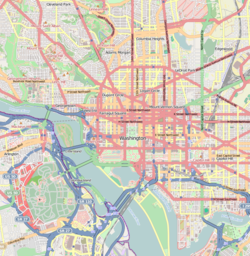 The square is located where the following streets would otherwise intersect: Massachusetts Avenue NW, New York Avenue NW, K Street NW, and 8th Street NW. Mount Vernon Square is bounded on the east by 7th Street NW, on the west by 9th Street NW, on the north by Mount Vernon Place, and on the south by a two-block section of K Street NW that is slightly offset from the rest of K Street. In the center of the square is the Carnegie Library of Washington D.C., finished in 1903, as a gift of industrialist Andrew Carnegie. The white marble Beaux-Arts building was originally the central library for Washington, D.C., and later housed the Historical Society of Washington, D.C. An Apple Store will occupy the building. The square was in the original L'Enfant Plan for the city but in the early 1800s was divided into four triangles by the intersection of Massachusetts Avenue and New York Avenue. The old Northern Liberty Market stood along Seventh Street until 1872, when it was demolished by Governor Alexander Shepherd in a night raid with two to three hundred men. The roadways were removed in 1882 at the request of residents who complained that "in its former condition the constant passage of vehicles of all descriptions through the park made it unpleasant and oftentimes dangerous for those frequenting it." The Carnegie Library of Washington D.C. was built in 1903. It was the central library for the city until 1972, when the Martin Luther King Jr. Memorial Library was completed. The library sat abandoned for a decade until it was renovated as a library for the University of the District of Columbia. In 1999, the library became the headquarters for the Historical Society of Washington, D.C. The City Museum of Washington opened in the library in May 2003, but closed less than two years later. In 2008, a sculpture was installed on the lawn at the south side of the square - "The Hand" created by Jim Fauntleroy in the 1960s for the Southern Christian Leadership Conference’s Poor People’s Campaign. The Washington Convention and Sports Authority took over the library building in 2011, renting it out for events. The building underwent significant renovations in 2018, to accommodate a new Apple Store and exhibit space for the Historical Society. Mount Vernon Square also refers to the neighborhood northeast of the square, extending north to O Street and east to New Jersey Avenue. In the early 20th century, Victorian-style townhomes occupied the area, and it was a vibrant business district until the Great Depression, when the area went into a steep decline. During the 1968 Martin Luther King, Jr. riots, the area around the square suffered rioting, arson, and extensive vandalism. In the 1980s, 7th Street was shut down for several years during the construction of the Green Line (Washington Metro) - the Mount Vernon Square station opened in 1991. Washington's Chinatown is just south of the square, the Shaw neighborhood is just to the north, and Mount Vernon Triangle is the neighborhood directly to the east. In 1977, the city used eminent domain to purchase several blocks southwest of Mount Vernon Square. Over the next few years, the homes and businesses on these blocks were razed. The old Washington Convention Center was constructed on the area block bounded by New York Avenue NW, 9th Street NW, H Street NW, and 11th Street NW. Construction on the center began in 1980, and it opened on December 10, 1982. At 800,000 square feet (74,000 m2), it was the fourth largest facility in the United States at the time. However, during the 1980s and 1990s, numerous larger and more modern facilities were constructed around the country, and by 1997 the Washington Convention Center had become the 30th largest facility. In 1998, construction began on a new larger convention center, occupying several blocks directly north of Mount Vernon Square. The new convention center was completed in 2003, and renamed the Walter E. Washington Convention Center in 2007. Many small businesses existed around Mount Vernon Square before the construction of the convention centers. One of the last businesses to exist on the west side of the square was a Chinese restaurant named Nan King (which was one of the first restaurants in the city to serve dim sum), which was open until 1979. By 2004, Alperstein's Furniture was the only store on 7th Street to survive through the construction of the Metro station and the new convention center. It closed in 2014, with a restaurant moving into its building. On the west side of the square is the 901 New York Avenue office building (headquarters of law firm Finnegan, Henderson, Farabow, Garrett & Dunner), completed in 2003. On the east are two large office buildings, including the headquarters of law firm Arnold & Porter (opened 2016), and the headquarters for the Association of American Medical Colleges and the American Dental Education Association (opened 2014). On the south side is the Renaissance Washington DC Hotel (opened 1986), and the Techworld plaza office development (opened 1989), which is undergoing redevelopment and re-branding as "Anthem Row." Across from the northwest corner of the square is the Washington Marriott Marquis, the largest hotel in the city, which opened in 2014. The lot at the southwest corner of the square was the former site of the old Washington Convention Center, now the CityCenterDC development, which opened in 2015. There are two historic buildings northwest of the square: the Mount Vernon Place United Methodist Church and the American Federation of Labor Building. The Mount Vernon Place church was built in 1917, by the Methodist Episcopal Church, South. The Labor building was built in 1916 as the headquarters for the American Federation of Labor. ^ a b c d e f g h i Bednar, Michael (2006). L'Enfant's Legacy: Public Open Spaces in Washington,. JHU Press. pp. 129–136. ISBN 9780801883187. ^ Karen Goff (December 6, 2016). "Exclusive: Apple agrees to open flagship store at Carnegie Library". Washington Business Journal. ^ Farquhar, Michael (March 23, 2003). "The Past is Present". Washington Post. ^ Valente, Judith (December 11, 1980). "UDC Opens $4.2 Million Library, But Its Campus Not Likely to Be Built". Washington Post. ^ Trescott, Jacqueline (October 9, 2004). "City Museum to Close Its Galleries". Washington Post. p. A1. ^ Mann, Auburn (November 25, 2015). ""The Hand" to return?". Takoma Voice. ^ Kelly, John (June 28, 2011). "D.C. agency comes to aid of troubled Historical Society of Washington". Washington Post. ^ Kelly, John (May 7, 2018). "The past will get a bright new future at the Mount Vernon Square Apple store". Washington Post. ^ Wheeler, Linda (February 24, 1996). "In the District's Mt. Vernon Square, Faith Keeps its Residents Going". Washington Post. ^ Wheeler, Linda (May 6, 1991). "Metro Brings Despair, Hope". Washington Post. ^ Hoffer, Audrey (May 23, 2014). "Where We Live: Mount Vernon Triangle, high-rise heaven". The Washington Post. ^ Pianin, Eric. "Gala Debut Is Set For Long-Awaited Convention Center." Washington Post. December 10, 1982. ^ Fernandez, Manny (July 21, 2002). "D.C.'s Wonder Of Architecture Nears Fruition". Washington Post. ^ Stewart, Nikita (November 4, 2007). "Facility to Be Renamed Tomorrow In Honor of Ex-Mayor Washington". Washington Post. ^ Seaberry, Jane (May 8, 1979). "Time Ticks Along for Repair Shop". Washington Post. ^ Burros, Marian. "Dim Sum Is Greater Than Its Parts." Washington Post. January 25, 1979. ^ Fisher, Marc (March 25, 2004). "Only 7th Street Stalwart Is Left To See New D.C." Washington Post. ^ Cooper, Rebecca (August 20, 2014). "CityZen Chef Eric Ziebold to open new restaurant near Mount Vernon Triangle". Washington Business Journal. ^ Mazzucca, Tim. "Firms Fight Over Office With Downtown Image." Washington Business Journal. June 6, 2005; White, Suzanne. "901 New York A Go for PoGo." Washington Business Journal. February 3, 2003; White, Suzanne. "Boston Properties Signs Anchor Tenant at 901 New York." Washington Business Journal. March 19, 2002. ^ Sernovitz, Daniel J. (April 29, 2016). "Boston Properties delivers 601 Massachusetts Ave. NW". Washington Business Journal. ^ Plumb, Tierney (January 6, 2011). "AAMC picks new headquarters location". Washington Business Journal. ^ "ADEA Announces Plans to Relocate to the New Association of American Medical Colleges (AAMC) Building". Bulletin of Dental Education. American Dental Education Association. 47 (9). September 2014. ^ Banister, Jon (November 15, 2016). "Meridian's $142M Renovation Of 700 K St Looks To Create A Unique Style Of Trophy Office". Bisnow. ^ Bhattarai, Abha (June 15, 2014). "Six weeks after its opening, Marriott Marquis hosts ribbon-cutting ceremony". Washington Post. ^ Narnia, Rachel (June 20, 2015). "Your guide to CityCenterDC: Where to eat, shop and relax in D.C.'s new luxury neighborhood". WTOP News. ^ Zauzmer, Julie (October 8, 2017). "On its 100th birthday, a church repents for its racist founders". Washington Post. Wikimedia Commons has media related to Mount Vernon Square.